Before Christmas we headed up to the Sunshine Coast for the day. Feeling a little peckish around lunchtime, we stopped off at this amazing little Cafe at Rosemount called It’s Rawsome. It specialises in Raw Food, organic and vegan. Nothing boring about this food at all. It was the best and most delicious place I had eaten at for ages. Damien had raw wraps and I had raw zucchini pasta. Then we shared a fantastic raw cake. Now that gave me an idea… to create something like that of our own for Christmas lunch for the non-carnivores. Check the Ecobotanica Facebook album for more pictures of our raw Christmas lunch dishes and the It’s Rawsome meals that inspired me. 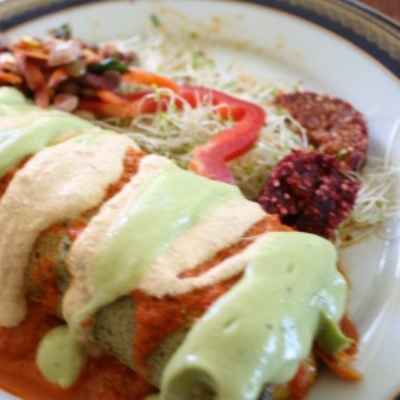 Here’s how to make a batch of raw zucchini wraps and the filling and sauces. These are based upon the recipes by Doreen Virtue and Jenny Ross and their little book ‘The Art of Raw Living Food’. Available from the BCC libraries. I used a dehydrator to make the wraps but you could also make them in a very cool oven. Start with the wraps the day before, the sauces keep 5 days in the fridge and the filling is made on the day you need it. Simply blend all the ingredients in a blender until they are thick and smooth and no longer grainy. It took me about 1 ½ minutes in my Breville blender. Immediately spread the mixture ½ centimeter thick onto 4 paraflex dehydrator trays or onto 4 oven trays with lined with baking parchment. Dehydrate 110F/50C for 4-6 hours, then remove to an airtight container ready for use. I cut the wraps in half making 8 rectangles. Toss all the ingredients together. Spread the wrap with pesto sauce then add a generous amount of filling. Roll up and top with Red Pepper Sauce, Pine Nut Sauce and Avocado Sauce for a colourful edible event! Blend all ingredients until thick and creamy. It may take a minute or so. This is lovely on wraps or as a dip, and on fishy dishes too. Blend all ingredients until thick and creamy. It may take a minute or so. This one is so creamy and delicious, I could bathe in it! This recipe may be consumed as a small portion of chilled soup. It looks and tastes superb.